The Qikiqtani Inuit Association (QIA) has taken to social media to encourage the increased usage of Inuktitut , the Inuit language. Based in the Qikiqtani (Baffin) Region of Nunavut , Canada’s youngest territory, the organization works to “safeguard, administer and advance the rights and benefits of the Qikiqtani Inuit”. This is especially important because researchers note  “a decline in the quality of Inuktitut in Nunavik — including poor grammar, a low level of vocabulary and increased mixing of Inuktitut with English.” According to the researchers’ report, contributing factors may include the influence of non-Inuktitut-language media and an insufficient number of teachers fluent in Inuktitut. According to information collected from various sources  by the Endangered Languages Project, there are between 14,000 and 30,000 native speakers of Inukutit, but the language is considered to “vulnerable” according to UNESCO's Atlas of the World’s Languages in Danger . The online campaign being conducted on Instagram , Twitter , and Facebook , introduces Inuktitut words written in Canadian Aboriginal syllabics  and pairs them with prints produced by the Kenojuak Cultural Centre and Print Shop  in Cape Dorset. 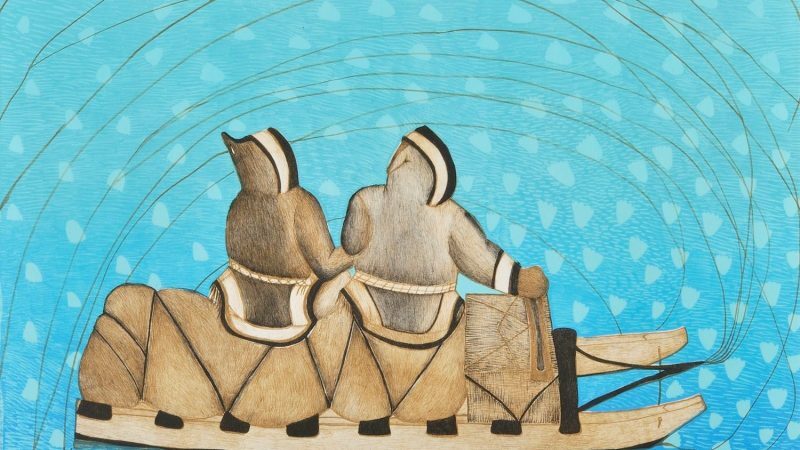 The illustrations illuminate many aspects of Inuit culture. The Word of the Day project is another of several initiatives designed to promote the language. The QIA sponsors an annual Inuktitut song and poem contest, as well as the production of early childhood education materials. In collaboration with Inhabit Media , an Inuit-owned publishing company based in Nunavut, the QIA produces children’s books authored by Inuit authors from the territory. To see the full set, visit the @Qikiqtani_Inuit  Instagram account.